The Rueth Team of Fairway Mortgage is the proud Exclusive Annual Sponsorship Partner of the Denver Metro Real Estate Market Trends Report. Nicole Rueth of the Rueth Team of Fairway Independent Mortgage Corporation is personally committed to each client’s success story. As an owner of 19 rentals, an educator, and with over 17 years of experience in the mortgage industry, Nicole has the highest level of experience and knowledge to help clients experience the American dream of home ownership. Backed by the largest national private lender; the Rueth Team is dedicated to building multigenerational wealth through real estate and finding creative loan solutions. The Rueth Team’s clients can rely on a smooth transaction with an Earnest Money Guarantee and 100% closing on-time track record. 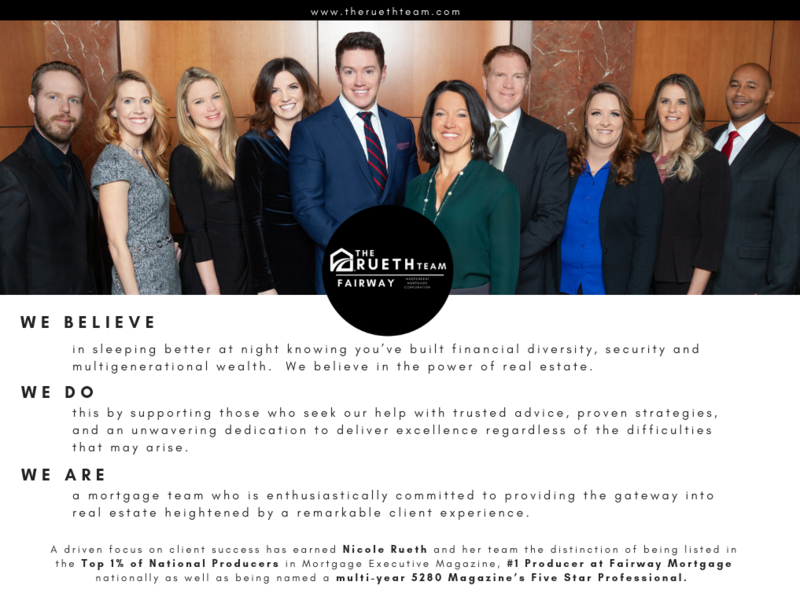 A driven focus on client success has earned Nicole Rueth and her team the distinction of being listed in the Top 200 of National Producers in Mortgage Executive Magazine as well as being named a multi-year 5280 Magazine’s Five Star Professional.